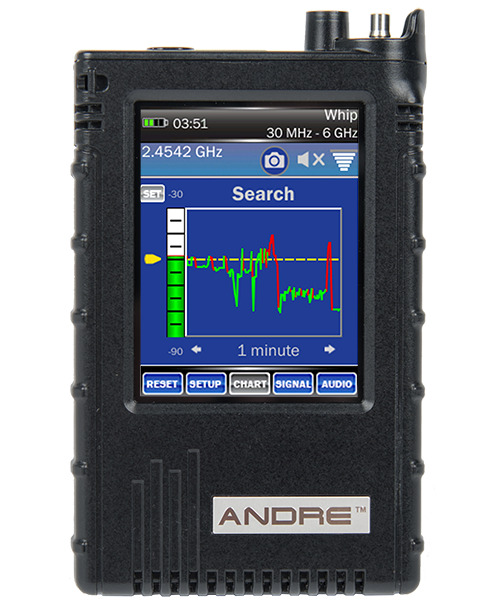 The ANDRE is a handheld broadband receiver that detects known, unknown, illegal, disruptive, or interfering transmissions. The ANDRE locates nearby RF, infrared, visible light, carrier current, and other types of transmitters. Access to eavesdropping and electronic bugging devices is becoming easier and more affordable. 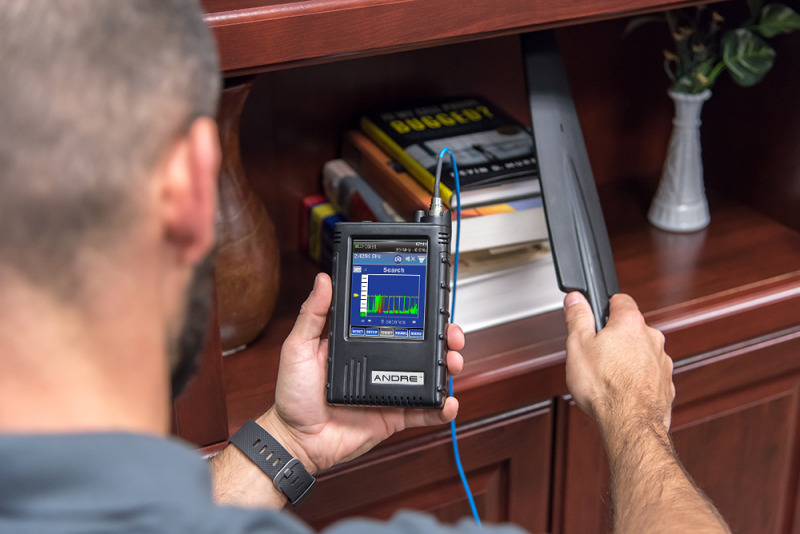 Quickly and discretely mitigate these threats using a wide range of accessories included in the ANDRE Advanced Kit that are specifically designed to receive transmissions across a 1 kHz to 6 GHz frequency range. The ANDRE features a signal strength histogram displaying RF levels over user-selected time intervals ranging from 5 seconds to 12 hours. Observe differences between (a) digital, (b) analog, and (c) burst signals and set alert thresholds. The ANDRE frequency counter automatically generates a signal list from the strongest signals. Signal frequencies are listed beginning with the strongest signal and can be designated as threatening, friendly, or unknown. Doubletapping a signal provides more details including band classification information. The ANDRE can demodulate and playback live analog audio. Ten second audio files can be recorded, stored, and played back. The live audio screen displays a bar graph showing received signal strength. Trusted Distributor of REI products for 20 years!